For an album of event photos, click here. Boy, was that a good time! 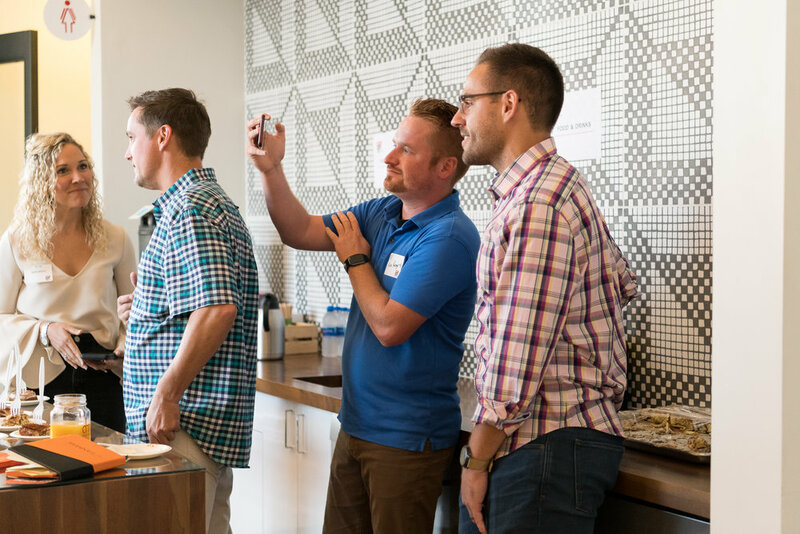 A do-good crowd of social media enthusiasts gathered together on the 4th floor of Union Hall to celebrate Social Media Day in Cincinnati on June 30, 2018. They came hungry, and they left inspired. Read on for our top takeaways! Our keynote, Cameron Bartlett, taught us the importance of trying new things - not just because it keeps us inspired and can keep our community alert, but because the algorithms reward it. In his work with IJM and Compassion International, he tested everything from text on images and Insta filters to media format and copy length. These experiments took some time to set up, but they paid off in many ways - not just more likes/post but more efficient fundraising thanks to the engagement audiences he created. For example, he built an audience of video viewers and retargeted them with a call to action. One thing a lot of us marketers get caught up in is measuring results after-the-fact. This is often a self-fulfilling prophecy, and the opportunity is to go in with some theories on what you'll test and the results you expect to see. This not only puts you on a continuous improvement track, you'll also be able to 'sell' the benefits of social to the rest of your organization. In Cameron's case, he led fundraising campaigns where Facebook Ads contributed to 87% of all dollars raised. Who do you think people consulted the next time they wanted to raise anything across the organization? It's now widely known that the power has shifted to users of social media, as brands fight for a smaller and smaller piece of the attention pie. This means we have to figure out ways to put our brand message in the hands of everyday people, from new employees to loyal customers. The responsibility is to inspire a culture of creation, striking the right balance between ensuring brand guidelines are met and allowing for creative freedom. In other words, it's time to pass the mic. During the panel, a question came from the crowd about formalizing an ambassador program for your organization. The women from Cincy State of Being cautioned us from formalizing a program too early - or unnecessarily. According to them, the best ambassador program is one that people don't realize they're 'officially' a part of. Be a remarkable business, pull your worth of mouth advocates in even closer and grow it naturally. Whether you attend Crossroads Church or not, it's likely you've heard their message in one form or another. That's not by accident. One of our panelists, Deeter Ceslar, shared that his team is constantly shifting and expanding the avenues by which as many people as possible can not only consume but also share the content they're putting out. Share of voice doesn't favor the lazy, and this church is on fire with creativity - they're blogging (sort of retro, right?) with Buzzfeed-style headlines, they've launched multiple podcasts in the last year, and they're livestreaming their worship each morning to Facebook. Speaking of expectations (👆), they're breaking through them again and again. Since user-generated content is shared and engaged with significantly more than brand-generated content, it's so crucial that we deliver experiences people will remark about - and these often fall outside of the normal, everyday delivery of your product or service. This entails listening for what people are saying, and being very intentional about what they might want. Molly and Meriden from Cincy State of Being shared a great example, where they regularly invite their most engaged followers to exclusive events (even wine night at one of their houses!). The opportunity? Get to know the people right in front of you, moving them from contacts or followers to true connections. In our fast-paced world, with new shiny objects distracting us from one minute to the next, it's easy to bend and to get off-mission. Kiersten from Women of Cincy emphasized this and provided many reasons why. Not only does it keep your team - internally and full-time, externally and part-time - delivering a consistent message, it's more inviting to people who can make a clear choice to join your mission or someone else's. When Kiersten's team has made tough decisions about causes to support, they come back to why they exist and their four pillars. Janaki, from TiER1 Performance Solutions, shared the story of Cincinnati Scurry, which is an amazingly fun team adventure throughout the city to raise money for an important cause. This year’s beneficiary was Cincinnati Children’s “Surviving The Teens” program. Social media was an important part of their efforts to not only promote and encourage participation in the Scurry, but to raise awareness about the issue of youth suicide in the Greater Cincinnati area and help decrease the stigma attached to talking about mental health. Every element of the scurry was designed to be fun, distinct and shareworthy - immediately to social, but over time as camaraderie and accomplishment sparks regular storytelling. It's tough to get someone's attention, and it's even harder to compel them to share. One way to lighten the load is to tune into and leverage existing behavior - versus forming new habits, which can take a lot of convincing (and resources). A great example comes from Kiersten at Women of Cincy, who noticed that many women pointed to their moms as the most influential person in their lives. This led them to launch a Mother's Day campaign, featuring their stories. It took off! The women featured in the story felt honored and every woman who consumed the content could relate - both were compelled to share with others. We're leaving #10 to those in attendance! Comment below and we'll update the post with our favorites. Looking for more opportunities to network and learn? Stay tuned to our next Social Media Show & Tell event in Sept. Visit the site and sign up here to get notified.